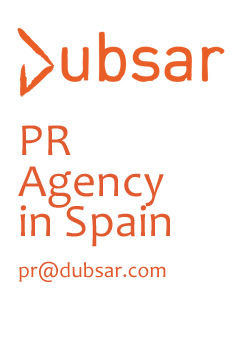 If you are looking for a PR agency in Spain, you will find in Dubsar a reliable partner for your communication needs. We will help you identify your audiences and the best way to reach them, funneling your message through traditional and digital media. We are experts in digital and social media, but the role of mass media is still very important and pitching relevant content to the right journalists requires an expertise that is the core of our strenght. We are journalists, we understand PR as a service provided to our customers, but also as a service to media professionals, providing information that in the end will be interesting for an audience. This approach has ensured our long track record of successful relationships with the media. We will liaise with the media -mainstream, regional or specialized- to increase your visibility and raise awareness of your messages. Furthermore, we will find the right place to hold the event and battle with the suppliers to get you the right price. We are a PR agency in Spain that provides all the services you need related to public relations domain. Apart from what we have already mentioned, digital content, naming, training of spokespeople, crisis management, copywriting, digital marketing and more services are included as part of our job. Moreover, we are big thinkers who find imaginative ways to optimize sites in order to keep brands out front during search. Let us to deliver your message! Active listening in order to build a strategic plan. Modular services to reach Spanish audiences. Management of media coverage and maximise of positive impact. Looking for a PR Agency in Spain? If you are looking for a PR agency in Spain, we are your reliable partner for your PR needs in Spain. Our database of contacts, developed formore than five years, allows us to ensure you that your message will be deliver in the proper media and in a timely manner.